For a fresh take on an old favorite, just whip up some dressing, chop some romaine, and toast some day-old bread into garlicky croutons--so much more satisfying than bottled dressing or salad mix from a bag. Make this easy recipe fully vegetarian by omitting the anchovy paste and Worcestershire sauce. Or, enjoy as is, with a zesty bite to it. Make the dressing: Mix the oil, lemon juice, mustard, garlic, and Worcestershire sauce & anchovy paste (if using). Whisk briefly in a bowl. Coarsely chop lettuce and rinse and spin the salad dry (or run under cold water and pat dry with paper towels). Place the freshly grated cheese in the bottom of a large salad bowl. Add the romaine, pour the dressing on the top, and toss to combine. Make croutons: tear up or cut day-old bread (English muffins also work well). In a small saucepan, mix a little bit of olive oil and butter with salt and garlic powder (or just use garlic salt). You can also add in some dried parsley flakes. Mix over low heat until the seasonings are dissolved and the liquids are melted. Take off heat, and in a bowl combine with the bread chunks. Toss to coat, then spread on a lined baking sheet for 15 minutes at 300. Stir, then let cook for another 10 or 15 minutes until they brown. 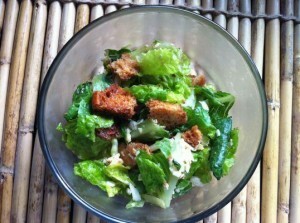 Top salad with croutons and serve! If you aren’t using the croutons the same day, they’ll keep fine for a little bit in a plastic bag.